How Many times has it happened with you that you believe in a particular cause, you have some skill and you try to help the cause with your skills? Atleast that has been a way of living for Prerna singh Bindra, as I follow her works through net sitting here in the little chair of mine. Well here is an exceptionally good writer, who might as well write fiction beautifully but has chosen to devote her writings to "Tigers" something that is too very close to her life. I deeply admire this very thing about this author. The tiger reminded me of those numerous books by kenneth anderson and Jim Corbett which I never read, one because I never had time for it and two I preferred other books over it. But turning a few pages of the book and looking at a list of different national parks in the content list, I thought this must be a very informative book about the details of various national park and I might like to read it as a refernce book. To my surprise it was neither a refernce book nor very informative. But I liked the book, a lot more than what I had expected from it. What Made me like the book? This is a more of a travelogue, about a young girl's (photos of the author does not make me feel that she has had 25 years of experience in wild life, compared to experts that she talks about, I would like to call her a girl) journey not just thourgh the forests of India searching for the her beloved tigers, but also an emotional journey that she has felt all along and has penned so well. She makes you travel with her and see the wild cats of India from her eye, which is both compassionate and in awe for the wild cats. Secondly, she almost brought to life and gave human faces, attributed habits, created personality of each of the animals that she talked about. That to me was her writing genius. Thirdly and most importantly, everyone should read it for the message that the book wants to spread. Conserve country's endangered wild species, or one day you will be wiped off similarly. The book is full of photographs (some 200 of them), and all bringing to life the stories and characters (tigers, elephants, leopards...) that she is talking about. The book, in its 22 chapters tries to bring the status of the various national parks and wild cat habitats of India. She starts her travelogue with Boomburam, whose picture she loves to see in her house, a tiger of Ranthambore. Who awed Bill Clinton, who mispronounced him as Boomerang and fell in love with him at the very first sight. As you read you understand not just the beauty of the place but also the economy surviving there on wild life tourism. (The one thing that impressed me the most was the "tiger cut" in barbers' shops). Next she talks about Rajaji National park and how human development is taking away the homes from our endangered fauna. A railway track going across Chilla, a village there makes the wild life and the wild commercialization cross path every now and then. 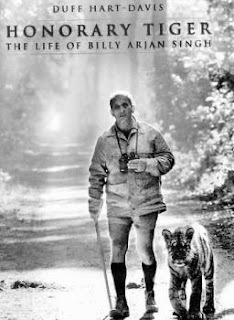 Then comes the story of Dudhwa and Billy Arjan singh, and the pets he brought up. You feel so emotionally involved as you read about Tara, a tigress he brought up, coming to Billly to bid last good byes as she was migrating from the forest with her cubs. Salutes to you Billy. Namdapha, comes across to me as a forest that I did not know anything about. Here is a beautiful landscaped forest with the rarest of wildlife, with snow leopards, clouded leopards and ofcourse tigers. Ms. Bindra's stint with the closest relatives of Human, the gibbons is definitely interesting. Next the author takes us to the land of Mowgli, where she talks of Pench and Kanha and the people there. The wild dogs, leopard, Barasingha all seems to be as much a part of these villages as the porters there. Though the game has been thinning here too. The message that here is a place where birds, animals and water does not follow the lines of control made by the governments, comes across strong from this North east forest reserves of Manas. The story of Manas is as interesting with army of 2 countries, villagers and surprisingly ex-poachers coming together to protect wild life. The poachers now want ot make their bread from tourism rather than killing the animals. Bodo man and woman she describes are equally intriguing. 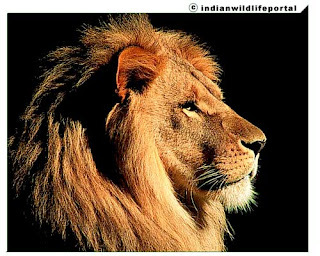 Then comes the forest so close to my heart, place where i have been and the place where recides the only forest which still preserves the asiatic lion, Gir. It tells us a tale of how the sports of Nawab, hunting has brought the population of Lions down. Human beings have invaded the lion house and now Lions occasionaly takes his tax (as a farmer describes the same in the book) in form of the cows and buffaloes that they own. Then came the land forest of the Vidarbha, Melghat. The beauty of this part of the book lies in the way Prerna weaves the story of people along with the forest. I especially liked an event where she gets so very excited with the pugmark of her beloved tiger. "He was here" is all he says looking at AT and BT marks (after tiger and before tiger). Bandipur forest of Karnataka as described by the author to me remained in my mind as, as much a land of elephants as anyone else. All the elephants (Padmaja, Padmini...) and the leopard Baby come to life as the author describes how the royal descendents of Mysore are trying to conserve the wildlife here. The next chapter is not about a place but about another cat, the Leop ard. The concern of this beautiful cat going the tiger's way, getting hunt and killed for money, for skin, for bones moves me. Photograph of a leopard who got entangled in a trap and people laughing at him, brought a tear to my eye. How cruel and hypocrites are we behaving so insensitvely. The story of Palamau is the story of Rani, only tiger left in the reserve, she wants to live a normal tiger life, has her wishes to mate and not get extinct in this world of human beings, but she will have to get extinct one day as there are no male tigers here. 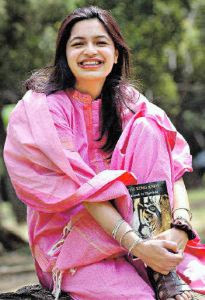 Authors' converstation with Mohammad Omar, whom she refers as "Father of the unmarried daughter(rani)" are a good read. He was killed later by the terrorists who have made the forest their abode. 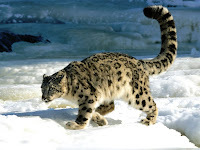 The author then travels all the way near Leh to Rumbak valley in search of snow leopard. Her guess of looking at the thick tail of snow leopard in the dark of night, makes her feel satisfied for her visit to the place. The tigers of Panna are known by their radio frequency numbers, which are used to track them. The only exception to this was Ms. 52, whose name comes from her eyebrow shape. She happens to be mother of most of the tigers in Panna. Here is a bleak effort of saving a species that is being killed by poachers as much as ever. For Kaziranga, the park has more to discuss than the wild cats. The author takes us through series of royal interactions to the wild life here, One horned rhinoceros, elephants and wild buffaloes. She then visits in the Nilgiri hills to the place made famous as "Cheetal walk" by E.R.C. Davidar . She meets the elephant camaraderie of Rivaldo and Ronaldo here. Evening does not allow her to sleep in the tiny room there due to the ghostly cries of Hyenas. Cheetal walk true as her read was a place belonging to both human beings and Animal equally. Then she talks about Bandhavgarh, which shows the superficiality of the way we have treated our wild life. 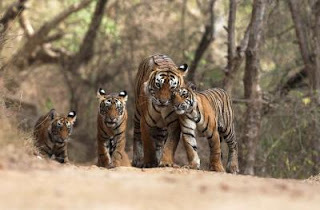 Bandhavgarh comes across as a commercialized wild life tourism spot where the wild tigers and elephants live in constant threat of people nearing them. 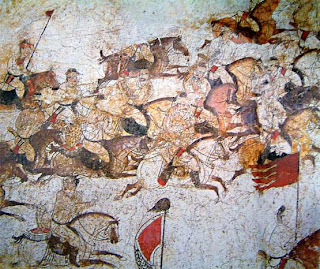 The place is also brings reminiscences of the tigress Sita, once a National geographic cover girl, as Ms. Bindra puts it. Obituary to Cheetah, makes you get worried and you hope that Tiger and Lion dont face the end that cheetah faced. The way the animal was used by humans to kill and to hunt was something that I never knew. Kings used to take cheetah on horse backs for hunting other animals. The last Cheetah was killed in India in 1947, the year Indians were set free. It was the hunter, the hunting weapon and the hunted at last. Sorry Cheetah, it was our mistake, we killed you. Carpit Sahab's (Corbetts) country comes next. The author is here not in search of tiger but tracking the path that Corbett tooks years back and the one that she has read for years. Corbett never killed tigers for the hunting sport but he killed only the miscreants who turned man eaters. He had his own wild life protection theory, which author explores as she meets people of Kaladunghi and Kaatkinaav. I have been to the Corbett national park, and I must agree you need to be there to feel it. Then comes the story of Sariska Tiger reserve, which could not preserve the tigers. A story of the collosal failure of the Wild Life protection systems in India and its politics. A part of Project tiger, Sariska Tiger Reserve include the leopard, jungle cat, hyena, jackal, chital, sambar, carecal, langur, wild boar, four-horned deer but no tigers now. In 2005, tigers abscence in the park was officialy declared to the people. The last part of the book and the afterword makes a strongly emotional and strongly human appeal for conservation of wild life. Tigers have been killed by man for thousands of reason. 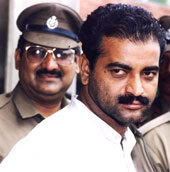 Criminals like Sansaar chand has killed more tigers and leopards than the nawabs and kings of past. We need to teach our selves that tiger skins and leopard skins are not the best kind of clothes, show people who buy it what happens to the poor animals and they will stop buying it. Tiger hunting because of human has been a greatly rewarding activity for poachers. 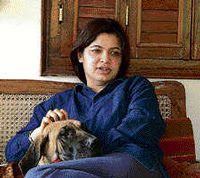 Prerna Singh Bindra is still fighting for the rights of the wildlife in India. I realize this as I read the latest (Aug 2007) article of hers in Pioneer, talking of the funds not reaching the national parks of Corbett and Ranthambore. She is trying to do her best to make her plea fall in to the ears of politicians which have more to gain from the tiger reserve funds than from the tiger reserves. The positives of the book as i suggested above is the emotional and mental connect that it draws from the reader and the visuals that are sprayed all over the books. The only negative thing that i thought was that the writings on each of her travel were a little to brief. But overall it is from the heart of a true child of nature. I salute the never dying and unflinching devotion of Prerna to the cause of conservation of wild life in India. She is fighting to get the rights of the animal back to them without glamourizing her work like others (she has written more than 1000 articles as a profile of her quotes in deccan herrald). Your Love for the wild animals, your curiosity for the wild, your compassion for the animals will definitely keep others inspired. A definite 4* for the book from me. I feel very happy and excited to read your comments on my blog. Thanks for the same, and over last 3 years I have recommended yoru book to more than 100 people. I had really liked the way you wrote things. There are incidences like you meeting a random monkey on one of your trips and your feelings on touching it, that are still etched in my mind after the first and only read. thanks a lot for writing this comment and that book.